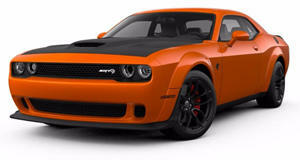 If this holds true, the Demon will push the bar so far ahead that the Hellcat may as well be irrelevant. If only NASA had the same sort of aspirations as Dodge, we’d have landed a man on Mars already. That's because even though Ford and Chevrolet continue to fight each other on the racetrack, apparently having taken offense at the fact Europe finds traditional muscle cars appalling, Dodge continues to build brash vehicles like the Hellcat with huge horsepower figures, which may soon be dwarfed by a 1,023 HP Demon. At least that’s what a rumor from Instagram account thedarkeststride via Jalopnik claims. Now we’ve heard quite a bit of buzz about the Dodger Challenger SRT Demon thanks to what amounts to a mini series worth of teaser videos, but while the hardware presented to us thus far is impressive, the rumored 757-horse power mill under the hood only caries a dismissible 50 horsepower premium over the Challenger Hellcat. The Hellcat has always been plagued with an inability to put its power to the ground, and upgraded drag tires and hardware should help with that, but what any enthusiast really wants is more power. According to the caption posted on the recently leaked image of the Demon on thedarkeststride’s Instagram account, this SRT-tuned Challenger may as well come with a Hennessey badge. That's because it will come with three power modes, a bit like the Venom GT. The first will crank out the 757 horsepower alleged by previous rumors while Power Mode 2 will supply 815 horsepower. Crank things up to Power Mode 3 and you get the full 1,023 horsepower provided the conditions are right. Those kinds of numbers are bewildering and help back up previous speculation about the Demon's drag times. Even the Bugatti Veyron and the Hellcat required a special key to unlock their full potential, and the Demon will be no exception. The Instagram post mentions that buyers will need to install a $3,000 Performance Control Module from the Demon Crate. Once that's in place, the car must be put into the redline-raising Drag Mode and ensure the fuel pumps are channeling 100 octane fuel to the V8 engine. It’s worth noting that this massive power premium over the Challenger Hellcat is more than enough to justify the hype Dodge put behind this car and would move the muscle car bar up so high that even the 1,000 horsepower Hennessey Camaro ZL1 Exorcist would be put to shame. It’s been said many times that the current pinnacle of technology one day trickles down so it’s accessible to everyone. Previously the Bugatti Veyron was the stock factory-tuned vehicle to opt for if you needed 1,000 horsepower for bragging rights. If the Challenger Demon comes with the power advertised by these rumors, we’ll be living in a world where horsepower is so easily accessible that the only reason to go to a tuning shop is if you want mustang hair and leather put inside your Mustang GT. Hold your breath until tomorrow night when Dodge officially unveils the Demon a day before the New York Auto Show press days begin.